Yet despite the fact that the H5N1 avian influenza has killed 60 percent of the 650 humans known to be infected since it was identified in Hong Kong 17 years ago, the "bird flu" virus has yet to evolve a means of spreading easily among people. 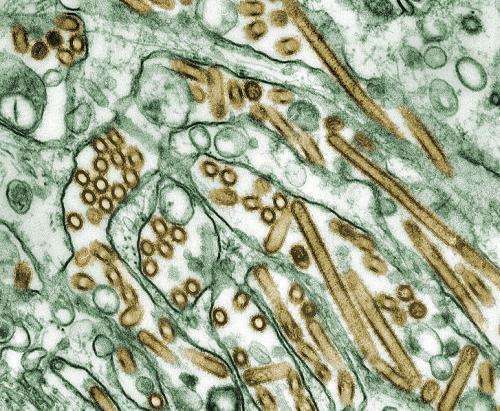 World health officials have long feared that the H5N1 virus will someday evolve a knack for airborne transmission, setting off a devastating pandemic. While the new study suggests the mutations needed are relatively few, it remains unclear whether they're likely to happen outside the laboratory. "This certainly does not mean that H5N1 is now more likely to cause a pandemic," said Ron Fouchier, a virologist at Erasmus University Medical Center in Rotterdam, Netherlands, and co-author of the study published Thursday in the journal Cell. "But it does mean that we should not exclude the possibility that it might happen." To do this, the researchers took a strain of the virus that had previously infected a human and altered its genes in the lab. Then they sprayed the altered version of the virus into a ferret's nose and placed the animal in a specially constructed cage with a second ferret who had not been exposed to the virus. The layout of the cages prevented direct contact between the animals, but allowed them to share airflow. When the healthy ferret developed flu symptoms - ruffled fur, loss of appetite and lack of energy - researchers knew the virus had spread through the air. Two of them improved the virus' ability to latch onto cells in the animal's upper respiratory tract. Once there, it could enter the cell, disgorge its genetic material and cause the cell to mass-produce copies of the virus. "Another mutation increases the stability of the virus," Fouchier said. "The remaining mutations enable the virus to replicate more efficiently." "This is important work," said Yoshihiro Kawaoka, a virologist at the University of Wisconsin School of Veterinary Medicine. "This could contribute to surveillance of avian influenza viruses in nature." Richard Webby, a virologist at St. Jude Children's Research Hospital in Memphis, said that although the study provided a valuable list of genetic traits to look for, the most important question for scientists and health officials remained unanswered. "The biggest unknown is whether the viruses are likely to gain the critical mutations naturally," Webby said. "If they can appear readily, then it is very worrisome. If not, then there's still a major hurdle that these viruses have to get over to become human-transmissible." Also, because of the Dutch government's concern that the virus could be weaponized, it successfully sued Fouchier and now requires him to apply for and receive an "export permit" before publishing his studies. "Certainly, there are still some people that would prefer that this type of research be discontinued," Fouchier said. "We will continue the debate with these people, but we have to realize that it is impossible to reach a global consensus on everything - or anything."